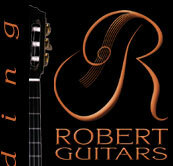 Robert Guitars are makers of fine classical guitars and short scale custom fitted concert guitars. A regular choice of many uncompromising concert and recording artists, Robert classical guitars are enjoying ever increasing international recognition and demand. 2010 marks the 25th year of professional dedication to lutherie. Mikhail Robert is a purist. Robert guitars are all about excellence. Because there is always a need for utmost quality, we are committed to revealing the very essence of professional concert grade guitars in each and every instrument. Over the last 25 years our focus has been to consistently create artist-quality instruments that provide the best possible sound while maintaining a subtle yet uncompromising aesthetic.